The Nazi German occupation of Poland claimed a staggering death toll: approximately 3 million Polish Jews, and up to 3 million Polish Christians, overwhelmingly Catholics. Since the 1940s – and particularly following the implosion of communism – volumes have been written on this subject, their relative quality notwithstanding. Many lacunae were eventually filled. Even so, the history of Polish-Jewish relations during the Holocaust continues to be plagued by stereotypes, prejudice, and propaganda. Setting the record straight, a team of logocentric scholars – Prof. Marek Jan Chodakiewicz, the head of IWP’s Kościuszko Chair in Polish Studies; Paweł Piotr Styrna, historian and KC researcher; and Dr. Wojciech Jerzy Muszyński of Poland’s Institute of National Remembrance (IPN) – has co-edited a much-needed corrective: Golden Harvest or Hearts of Gold? 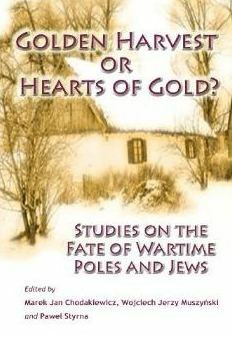 Studies on the Fate of Wartime Poles and Jews (Washington, DC: Leopolis Press, 2012). This original and insightful new study is an anthology of inter-disciplinary essays by specialists in history, ethics, law, and political science. Based on primary sources, forensic evidence, and survivor testimonies, the ground-breaking work challenges much of the conventional wisdom haunting scholarship on Polish-Jewish relations under the German yoke. Golden Harvest or Hearts of Gold? also seeks to restore individual free will to its rightful place in thinking about the Holocaust in particular, and inter-ethnic conflicts in general, which has been all too often handicapped by sweeping, collectivistic assumptions. Finally, the authors expose the unsavory and unsettling totalitarian pedigree of more recent interpretations of Polish-Jewish relations under the German occupation. The claim of mass Polish Christian collusion with the German Nazis in the plunder and extermination of the Jews, they demonstrate, is actually rooted in crude postwar Stalinist propaganda serving to legitimize the Soviet occupation of Poland. Ironically, the allegation that Poles benefited from the Final Solution also happens to echo Nazi wartime propaganda. Golden Harvest or Hearts of Gold?thus represents an effort to exorcise the demons of twentieth-century totalitarianism – which are incompatible with serious scholarship – from the field of Holocaust studies. This book is ideal not only for students of Poland or the Holocaust, but also for anyone interested in wartime psychology, ethical questions, and the dynamics of inter-ethnic relations. To discover more, please see the synopses of the book’s chapters are available in English at: http://heartsofgoldpl.com/. To learn more about the publisher, please seehttp://leopolispress.com. To purchase your very own copy of Golden Harvest or Hearts of Gold? please click here. This entry was posted in Books, News, Polish History on May 3, 2012 by IWP.